Swollen return with their third official full length along with making Moka Only and Rob the Viking full-time members of the group! 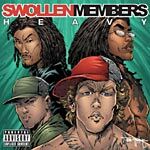 This is also the first Swollen Members album to feature only one guest appearance??! Produced by Rob the Viking except: 2, 4 Nucleus & Rob the Viking, 6 & 13 Evidence, 7 & 10 Nucleus, 11 The Edgecrusher, 14 Moka Only & Rob the Viking.